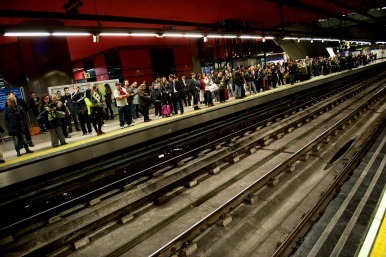 A man repairing trains for the Madrid underground rail service came across a cheque for $2 million in a wallet stuffed between two doors. Emilio Guerra handed it in to his manager, and police are looking for the owner. His honesty is to be applauded, but does it pay to be a Good Samaritan? The Metro reported that Guerra found the wallet containing the cheque, credit cards and a driving licence. It is thought that thieves took the cash in the wallet and left the rest, as the space between the doors is a favourite for pickpockets hiding stolen wallets. Guerra had no hesitation in handing it to his manager, who passed it to the police. The police are hunting for the owner, who El Pais reported was Californian. They said they would want to know where the money came from before handing it back. It shows an impressive level of honesty, the question is whether it will pay off. Of course, there's the reward of knowing he did the decent thing. In August a Walmart employee in Antelope, California, was leaving work when he came across a wallet - containing $4,000, a $1,000 cheque and credit cards. He found a number in the wallet and called the owner to return it to her - she was in the process of paying off a second mortgage, and without the money her home would have been at risk. The staff member didn't receive any payment for his honesty, but said he couldn't have lived with himself if he hadn't returned the money. There's also the idea that what goes around comes around. In July this happened quite literally to a student in Bath. He returned a wallet which he found on a night out. That same day he dropped his own wallet on his walk home - and had it returned with everything still intact. There are also unusual perks which can come with honesty. That same month, the comedian and actor Steve Martin dropped his wallet in Pennsylvania while he was out on his bike. A local called the theatre where he was performing and arranged to return it. His honesty was rewarded with a personal thanks from the celebrity. And occasionally, there are great financial rewards. Two weeks ago Glen James, a homeless man in Boston, flagged down a police car. He handed over a backpack containing $2,400 in cash and $40,000 in traveller's cheques, which he had found at the shopping mall. The backpack was returned to its owner, and the Boston police honoured the man with a special citation. Ethan Whittington of Virginia read about the story and decided to set up a fund for James on crowdfunding site gofundme.com. In two days it raised $110,000 to thank the Good Samaritan.